This morning’s loop was a huge success. 11 runners braved the cold temperatures at Riverview at 7am and cheerfully made their way around town on the Rivanna Trail in the counter clockwise direction. Near the Park (after passing Barracks area) we linked up with four other runners who had started the loop earlier than 7am. So there was 15 of us in total! There were a few planned early drops but most everyone finished and finished strong. The fun continued post-run at Beer Run. There happened to be a New Belgium rep dinning with his daughters behind us and, thanks to his brief conversation with Jason, graciously offered our group a complimentary round of their new Imperial Coffee Stout, which many of us happily accepted- including yours truly. It was tasty. Also, the footing on the trails this morning was the best I have ever experienced on the RT. Zero mud. Everything was frozen solid and super tacky. Three cheers for those low temps! Having run the loop twice in two weeks with several people I truly think there are going to be some real surprises time wise come a month from now. Personally, I won’t be that surprised. There are some strong runners in this group. But I do think several people are going to surprise themselves. This is a bit late for folks hoping for some descriptions this morning, but hopefully it’ll still be useful to somebody some day. Also, hopefully, I’ll work to incorporate useful bits into the RTF’s map – so if you’ve got comments, questions, suggestions, corrections please let me know. Please don’t get mad at me if you get lost while trying to follow these directions. And these are just my notes, not anything official from the RTF. I’ll start at Riverview, and generally go around counter-clockwise, finishing back up at Riverview. Riverview – River Rd: At Riverview Park, there are two trailheads out of the parking lot, both heading out on paved footpaths. One would be if you continue straight, the way you came in to the parking lot, the other goes off to the right, heading toward the playground area and Rivanna River. You can take either, they both meet up after a short while, and there are some un-paved cut-throughs between them. The trail will be a paved walkway for a few miles, and basically follows the river (which’ll be on your right), passing under route 250 at one point. Eventually you’ll pop out at a field with some soccer goals set up. You can continue following the trail, or you’ll see a parking lot off to your left – you can head up there and turn right on the road that’s there (River Rd). If you stay on the trail, it’ll go just a short bit through an area with some small trees, close to the river bank, and then there will be signs pointing you to the left. That trail heads up a hill, then runs along a fence at a VFW building until you get to the road (River, same road), on which you’ll turn right. River and Locust: Head up the hill on River, and at the stop sign at the end of River (at the top of the hill), turn right on Locust Ave. That’ll head downhill a little bit, and come to a T-intersection. Turn left at the intersection, onto Locust Lane, and then take your first little road to your right, Megan Ct. At the end of that short little road is a sign for the RTF, on the right. Locust – Holmes: From there, the trail heads downhill for a short bit, to get down to Meadow Creek. Once you get there, you’ll continue along with the creek on your right, eventually popping out of the woods into a clearing with the creek on your right but curving left in front of you, and houses up the hill on your left. Follow that clearing, staying between the houses and the creek, with a few hops across some drainage areas as you go. In this section, keep to the right side of the clearing. Shortly before getting to Holmes (the first and only road crossing), the trail and clearing generally veer right, and once they do you’ll be able to see Holmes ahead of you. Holmes – Melbourne: After crossing Holmes Ave, pick up the trail in the gap in the guardrail. This trail follows the Meadow Creek (on your right), with a cleared strip of land on our left. The single track eventually dumps out onto the cleared stretch, and you continue on, keeping the creek on your right. Once the creek turns left, the clearing ends and you go left into the woods, back on single track. This continues for a short bit, eventually crossing under Park St at its intersection with Melbourne. Just after crossing under the road, the single track is closed, and you must go left, up to Melbourne Rd. Melbourne – Meadowcreek Parkway: Once you get to Melbourne road, looking left you’ll see the intersection with Park. However, you want to go the other way, heading instead to the light at the Meadowcreek Parkway. You’ll make a right at the parkway to get on the paved footpath following the parkway. Meadowcreek Parkway – Railroad: Continue on the paved pathway, with an eye to your right to hop back on singletrack. If you end up going uphill on the paved pathway, you’ve gone too far (but the two meet up again, so it’s ok). The trail here stays basically along the Meadow Creek (on your right), and there’s a short steep hill to get you back up to the paved pathway when the two meet again. The singletrack and paved path meet at a large bridge for the parkway (above the trail) with a smaller footbridge for the paved path off to the right. If you were to go right on the paved path, it would wind its way uphill, eventually ending at the intersection of the Parkway with Rio Rd. However, to continue on the Rivanna Trail you do not want to do this. Unfortunately, at the intersection of the paved path with the singletrack, under the bridge for the parkway, what you do want to do is somehow find your way to the other side of the railroad tracks. Standing on the paved path, with your back to the singletrack, you’ll be looking at the bridge for the parkway. Just past that is the train tracks, at the top of a quick hill, and the creek is on your right. The creek passes under the train tracks through a culvert, and generally the water is not more than 2-3 inches deep, and the creak bed is even. Alternatively, steep trail can be found which goes up the steep embankment to the railroad tracks and back down the other side. Unfortunately, neither of these options is condoned. Railroad – Brandywine: If you should happen to find yourself on the west side of the railroad, north of the creek (looking away from the railroad, the creek is on your left), the trail follows another cleared strip of land, which has a few bushes and things planted. After a little wooden footbridge (the second), you find yourself on the creek bank of the newly completed creek restoration project. The trail is not well defined here, and the footing is a bit uneven and over a netting, but you just want to follow the creek. It’ll cross a paved pathway, running perpendicular to the creek at one point – going right would take you to Greenbrier Dr, going left would take you across the creek and to Jamestown Dr (where you could follow brown RTF blazes back to Charlottesville High, if you wanted (quickly: Jamestown becomes Lester Dr, which T’s at Kenwood. Turn right on Kenwood, follow it around to the right, up a hill, then turn left on Melbourne Rd)). However, to follow the RTF loop, continue straight, with the creek on your left. Before long, you’ll get to the three-way intersection of Brandywine Dr (going left, or straight-right-ish) and Greenbrier Dr (going right, sorta back the way you just came). Brandywine – Hydraulic: At the Brandywine/Greenbrier intersection, the trail continues in the cleared strip of land, sort of like where Greenbrier Rd would continue, if it didn’t end at that intersection, with the creek still on your left. A few hundred yards down that strip, look for a rock-hop creek crossing on your left, which has a cable strung up between the trees to aid your balance. You want to cross the creek here, and then veer right (so that the creek is now on your right). The trail moves a little bit away from the creek at this point, with woods on both sides of you (and houses up your hill on the left). There are no real trail intersections here, although some re-routing as the creek restoration project was in progress has provided some options at one point. As long as you’re continuing on with the creek on your right, houses up the hill on your left (and aren’t getting in people’s yards), you’re still on the right track. Just before the trail gets to Hydraulic, you can either go left, and up a quick hill to get to the road, or stay right, pass over a short rocky section, and then walk through a tunnel underneath Hydraulic Rd. Hydraulic – Morton: After crossing under Hydraulic Rd, continue on the singletrack (creek on your right), coming to a set of stairs which take you up to near the intersection of Hydraulic Rd and 250. At the top of the stairs, go right, following the concrete sidewalk, until just after crossing the bridge, where the trail turns left and heads down to the creek where it passes under 250. Underneath 250, you’ll be walking on some cement blocks which are starting to deteriorate, so watch your footing. After coming out of the tunnel, the primary (green) trail basically follows the creek (now on your left), eventually coming to the RTF tool shed (which will be on your right) near the Meadowcreek gardens. An alternate (brown) trail will branch off to your right, but reconnects with the main trail before the RTF shed. The trail is close to the creek after the shed, and parallels a gravel driveway. The two come together at Morton Dr.
Morton – Barracks: Turn right on Morton, and continue to the light at Emmet St (the intersection where Bodo’s Bagels is). Cross Emmet, and continue straight on Earheart (Cavalier Diner on your left, Asian market on your right). Near the end of that little road you’ll see a sign on your left for the RTF, at a wooden bridge. Crossing the bridge, the trail continues for a few yards and then crosses a chain link fence at a gate. The gate is rarely locked (though it is, occasionally). Once in the fenced area (if the gate wasn’t locked), turn right and follow the gravel path. While you’re still in the boundary defined by the chain link fence, there will be a right hand turn leading you out of the fenced in area, which you should take. Just after coming out of the fenced area, you’ll cross a little wooden bridge, and will see a road ahead of you (or to your right, depending on how quickly you look for it after you get off the bridge). Go out to the road (Cedars Ct), turn left, and follow it to its intersection with Barracks Rd. The trail continue straight across Barracks Rd from this intersection. Barracks – Leonard Sandridge: At the trail head off Barracks, you’ll go up a short flight of stone stairs, and then the trail goes to the right. It veers left shortly after that, then right across a wooden bridge (which can be fairly slick in wet conditions), and left again. It then follows the creek (on your left), for a little while. When you get to another wooden bridge (with “monkey bars” overhead), you can cross it and go left to hop off the trail at UVA’s “The Park” at North Grounds. Alternatively, you can cross the bridge and go right to follow a spur trail, which connects with the main trail again in about a tenth of a mile. The main trail, however, doesn’t cross this bridge (the monkey bars bridge), and simply continues on with the creek on your left. After curving to the right, it then does cross a different wooden bridge, this one with some flower pots built in. The trail then continues on a sort of gravel access road, eventually going up a short hill at a land bridge over the creek. The primary trail, at this point, continues straight. [[However, you could cross the land bridge. If you did, you’d come to the intersection with the trail from the monkey bar bridge (coming in from the left), and would also have the option of going right, to follow the trail up the hill. This trail is marked with green RTF blazes, and is parallel to the primary trail, which stays lower, and closer to the creek. If you decide to take this trail up the hill, the trail is easy to follow, and staying right at all the trail intersections will keep you on track.]] The primary trail and the alternate (hilly) route meet back up after a few tenths of a mile, and then continue on until a short steep climb up to Leonard Sandridge Rd. Leonard Sandridge – Old Ivy: Cross Leonard Sandridge, and cross the wooden footbridge to continue on the trail. There are no trail intersections in this next section to worry about, just continue on until you get to the next road crossing, which is Old Ivy Rd. The final hill before Old Ivy can get quite muddy. Old Ivy Rd – Ivy Rd: Unfortunately, there’s another train track in the way of what you want to do to follow the trail. If you were to cross Old Ivy and then turn into the second driveway (for Ivy Stacks, not UVAs Printing and Copying Services), and then follow that driveway straight/right, then just before it went left behind the building, you’d be able to look across the train tracks at the light which is the intersection of Ivy Rd and 29. Just next to the fire station, across Ivy from where you’re standing, is where the trail picks up. You might even see a little trail leading you across the tracks and down to the road. The shortest road detour at this point is to turn right on Old Ivy, cross over 29, left at the stop sign, under the train tracks, and then a left at the light onto Ivy Rd. Ivy – Fontaine (O-Hill): If you find your way to the fire station, on the south side of Ivy at its intersection with 29, the trailhead will be on your right (looking at the fire station, from the road), ducking immediately into the woods. From here to the next road is one of the longest uninterrupted sections of trail, if not the longest. Largely the trail is well marked, but there are numerous side trails to distract you (and you’re certainly welcome to wander). If you are following the trail (which parallels 29 (in a windy manner), generally off to your right) and come to an intersection and see no trail blazes, turn right, and you’ll be set. 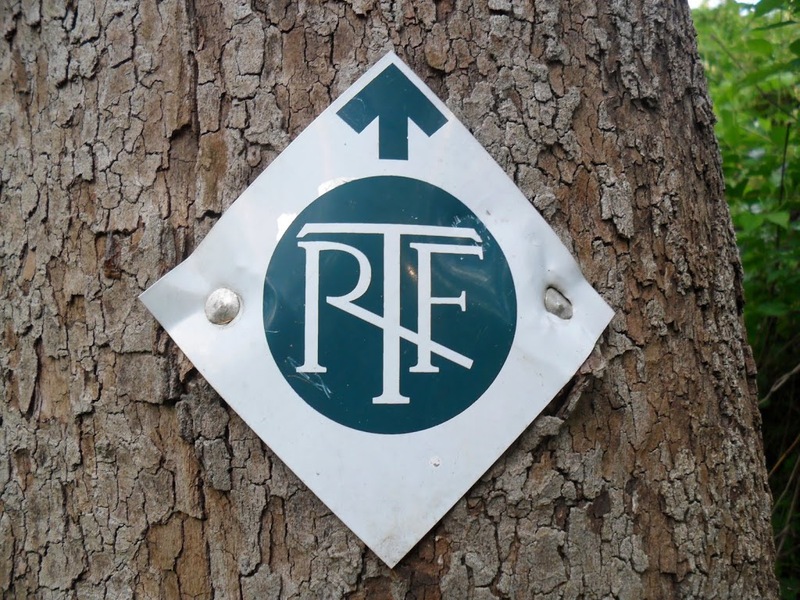 You may end up on a side trail briefly, but will connect with the RTF loop in short order. Eventually the trail comes out to Fontaine Ave, with the research park across the street (entrance at the light up the road to your left), and route 29 to your right (over Fontaine Ave). Fontaine – Stribling: The trail picks back up directly opposite Fontaine Ave, in a patch of woods. It winds up a hill, and then back down, in an area with lots of evergreens, and a nice soft surface. Owing to the lack of undergrowth, the trail may seem ill-defined at times, as it meanders through the trees, but it’s usually pretty easy to follow. On its way back down the hill, you’ll end up crossing a fence on a wooden ladder. The trail then climbs back up to the road, and you want to continue on the road down the hill. Just after crossing a creek on the road, look for the trail on your left. Head down the embankment, and follow the trail, which keeps the creek on your left. There’s a spur to your right that will take you up the hill, and comes back in and connects with the main trail just before the trail crosses the creek. At the creek crossing, the creek will head through a tunnel under some railroad tracks, and you can either rock-hop across, or walk across the black pipe. On the other side of the creek, the trail continues through a bamboo grove, and you should watch your feet for bamboo that was cut a few inches above ground level. The trail comes out to Stribling Rd, which is a dirt road, in sort order. Stribling – Sunset: At Stribling, turn right to go under the train tracks, then take an immediate right on what appears to be (and is) a gravel driveway. Take another immediate right onto the trail leading down into a grassy field. The trail generally follows under power lines, and then hits the gravel driveway again. When it does, turn right on the driveway, and then look for an immediate left to continue on the trail, before the driveway crosses a little wooden bridge. The trail then makes a left to follow the creek (on your right), and in short order goes right at a rock hop to cross the creek. On the other side of the creek, you go up a short little hill, and then the trail goes left (where the power lines overhead continue straight). The trail then follows the creek (now on your left), and just before coming out on Sunset Ave there’s a small creek crossing with a rock hop (but the main creek will still be on your left). Sunset – Azalea Park (on roads): At Sunset Ave, turn left and follow the road. It will eventually come to a bridge with some barriers that only permit foot traffic. Cross the bridge, and continue straight on Sunset Ave (the trail DOES NOT turn right and go into the woods again here). Continue up the hill on Sunset, eventually taking your first right on Brunswick Rd. 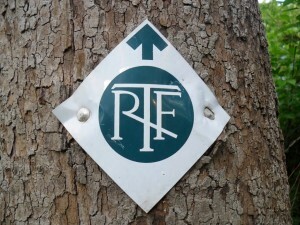 Follow green RTF signs along Jefferson Park Circle (basically clockwise along the east half of the circle), and then onto McElroy. Continue down McElroy, and it will eventually hook around to the right, where you want to turn left on Middleton Ln. Cross Old Lynchburg Rd on Middleton Ln, and then make your first right on Mobile Ln. Then look for a narrow pathway on your left, between the first two houses (or second and third, depending on where you start counting from). The trail then turns right on the paved footpath and continues downhill. Just before the paved footpath pops out in Azalea Park, look for the trailhead on your left, where you can continue on some singletrack before entering the open fields of Azalea Park. This trail will come out near the community gardens. Azalea Park – 5th St: At the end of the (newly) paved parking lot, with the community gardens in front of you (and Moore’s Creek to your right – which you’ll basically be following until it hits the Rivanna River, almost back at Riverview Park), a gravel driveway continues along the gardens. Follow this driveway, with the gardens on your left. At the far end of the gardens the driveway goes left, but the trail turns right, down an embankment to the creek. The crossing at this creek has some cement pillars and some rock hops, and a short, steep set of stairs at the far end. At the top of the stairs, turn left and follow the singletrack, with the creek on your left. This will eventually take you out to a clearing, and you want to basically aim for the far left side of the clearing. Near the end of this clearing, watch out for a bit of a pothole in the ground! At the end of the clearing, the trail continues underneath 5th St, through a culvert with loose sand footing. 5th St: After crossing under 5th St, the singletrack continues away from the road for about 10 yards, and then turns left on an old paved path. It then crosses a wooden bridge and makes a right, continuing as single track through a short section of trees, and then a bit of grass and weeds, with the creek on your right. The trail pops out behind a gas station, and crosses Bent Creek Rd, continuing to follow the creek. After crossing the road, you continue under some power lines, and at the third power line the trail heads left, up the hill to 5th street (a trail does continue straight, but this is not part of the Rivanna Trail). At 5th street, turn right, cross Harris at the light, and stay on the sidewalk along 5th. At the bottom of the first hill the road crosses a creek, and just after the creek crossing the trail turns right, taking you away from the road. 5th – Jordan Park: The trail away from 5th street follows the cleared strip of land, with the creek on your right (at the moment there’s construction vehicles at this trailhead). There’s a little wooden bridge over a drainage creek at one point, and the trail (and clearing) goes to the right from there, with houses up the hill on your left. Shortly after this, the clearing goes around to the left, but the trail veers off to the right down a little incline, and then turns left to follow the creek (still on your right). After a little bit the trail meets back up with the cleared strip of land, but then in about 100 yards there will be a wooden footbridge to your right, and the trail will hop back into the woods. Eventually you’ll come to another rock-hop creek crossing, and then pop out at Jordan Park. Jordan Park – Avon: The trail stays on the edge of the clearing of Jordan Park, keeping the park on your left. As you get closer to the road (6th St SE), look for the trailhead ahead of you, a bit on the right. Singletrack takes you between the creek and a collection of mobile homes. Just before coming to another road (Avon), go left to go up to the road. There, turn right and take the road as it crosses the creek, then cross the road. There’s a trailhead just a few yards up the hill, shortly after the metal guard rail ends. Avon – Riverview Park: Follow the trail away from Avon, back down towards the creek, and then along the creek (now on your left). At one point the trail makes a sharp right, away from the creek, and then a slight hairpin to the left, heading up a hill. Toward the top of the hill you may find some trail intersections, but following the green blazes will keep you on track. Taking trails which head left, down the hill, will take you to a bridge, which you can cross to get into Quarry Park (this bridge is being replaced, so this crossing may not be available at the moment). Following the green blazes, and skipping Quarry Park, the next road you come to is Rt 20. The trail crosses under Rt 20 at this point. After this, you just continue following the creek (on your left), eventually crossing under Moore’s Creek Ln (for the water treatment plant – you may notice a smell in this section), and then coming to an apparent dead-end at the train tracks. This is the wet part. Cross the creek, going through the water, under the train tracks high overhead. On the far side, the trail goes up the hill slightly, and then around to the right. In about a hundred yards the trail goes left up a little hill to put you on E. Market St. Turn right on Market, then take your first right on Riverside Ave. After going down the hill and through the road narrowing, the entrance to Riverview Park is on your right. Thanks both CAT’s, Neal & Nick, for adding to our great (trail) running community!